The Sharing Tree intercepts potential supplies before they enter the waste stream and resells them at an affordable price to arts and teachers. You are invited to this amazing event that supports this amazing organization. Mark Messermith has made a piece with materials from the Tree that will be auctioned off at the event. Local Artists Barbara Balzer, Honey Hilliard and Joan Matey will be at the event making sculptures with materials from the Tree that will be sold. On October 27th from 6-8:30pm, The Sharing Tree would like to invite our friends for an evening of creative live art making with a delicious dinner to support the community resource center. 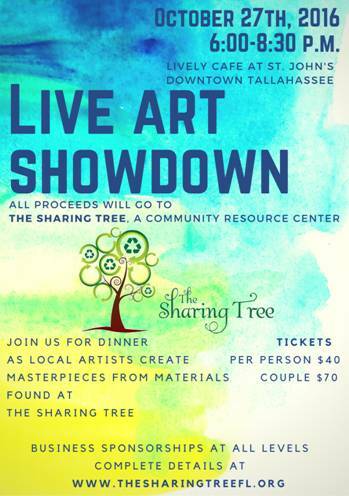 Live Art Showdown will showcase 3 local artists who will make a piece of art during the dinner event from unique items from The Sharing Tree. Artists include Honey Hilliard, Joan Matey, and Barbara Balzer. The artist’s work will be raffled off that evening. The famous local legend, Mark Messersmith has donated an artwork for the cause as well as a few other artists, all made from inspirational materials at the Tree! Each ticket includes entertainment, dinner catered by Lively’s famous Fran Doxsee (vegetarian option, menu can be viewed on website,) and a drink. Thanks to Grasslands, Whole Foods, and Williams Gourmet we will also be serving beer, wine AND cupcakes! This is a key year for The Sharing Tree and your support has helped us serve this community. We have given away almost one million dollars in classroom materials all while diverting waste from our landfills!